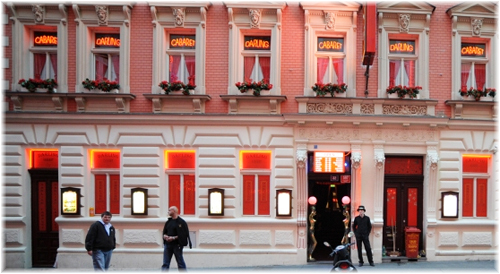 Prague is apparently famous for its beautiful women and its strip clubs. I was dubious, so to make sure, we decided to check one out. Photography is strictly prohibited, so I can't provide you with any interior shots. I can tell you that it costs us 300CZK to get in, which seemed like a lot considering that Meghan was admitted for free. Once inside, a Pilsner Urquell and a glass of red wine costs 780CZK, which works out to be robbery. Specifically, $39.55! I think this currency confusion is the real reason why the Czech Republic refuses to adopt the Euro. On the upside, the place was fun, and the women were gorgeous and all-natural, which pleased us both.